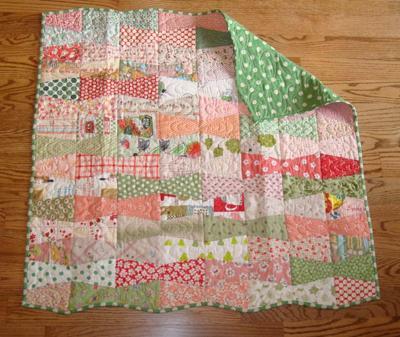 I love vintage and Japanese import fabric and I wanted to make a quilt that was a fashion accesssory for mom and sweet for baby as well. I changed the size of a traditional tumbler block to make it look more like a bow. It was machine quilted with 3 figure 8s inside the bows to accentuate the design. I've made several quilts with this design in modern fabrics but this one is my favorite. The colors blend together and the dot border and back make it pop. My daughter in law has fell in love with this quilt. She is expecting and it is my first grandchild. I would love to get the pattern. Is this possible? Can we get the pattern for this quilt. So cute! I love the colors and love the tumblers. Thanks for posting your quilt. Nanette! I's just perfect, from the colors to the binding to the pattern. I just love it all, your work is so amazing! Loved this quilt. It is a winner. Great design and colors. how did i miss this one. i adore this quilt. a great adaptation of this pattern and wonderful fabrics! I love love love this quilt. It really should win! I know the workmanship in this quilt is impeccable.